Search for all "ADARB1 / ADAR2"
Rabbit anti Human, Mouse, Rat ADARB1 / ADAR2. Synthetic peptide, corresponding to amino acids 480-530 of Human ADAR2. Western blot: 1/500 - 1/1000. Immunohistochemistry on paraffin sections: 1/50 - 1/200. 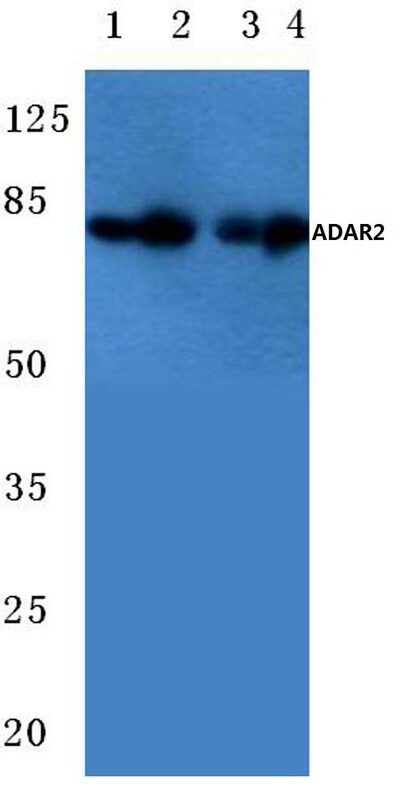 ADAR2, also designated adenosine deaminase, RNA-specific (RED1), RNA-editing enzyme 1, DRABA2, DRADA2, ADAR2α-L1, ADAR2α-L2 and ADAR2α-L3, mediates RNA editing by destabilizing RNA through deamination of adenosine to inosine. ADAR2 is responsible for pre-mRNA editing of the glutamate receptor subunit B by site-specific deamination of adenosines. It can modify its own pre-mRNA and generate new splice sites. Translocation of endogenous ADAR2 from the nucleolus to the nucleoplasm results in increased editing of endogenous ADAR2 substrates. Alternative splicing of this gene results in several transcript variants that may influence RNA editing. RNA editing involves the deamination of adenosines at specific sites, the result of which can be a change in the amino acid sequence of the protein so that it differs from that predicted by the sequence of the DNA. Affinity Chromatography using epitope-specific immunogen. Liquid purified Ig fraction (> 95% pure by SDS-PAGE). 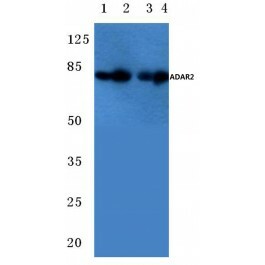 This antibody detects endogenous levels of ADAR2 protein.